Throughout the month of March the entire Northeast was impacted with numerous coastal storms. The 3rd storm over the course of March 13th and 14th was a powerful Nor’easter that brought heavy snow and strong wind gusts to Massachusetts and our Tribal lands which resulted in significant power outages due to an extended period of heavy wet snowfall and damaging wind (with the most significant outages in southeastern MA and the Cape and Islands), high snowfall amounts across much of the state, damage to trees and poles/wires, hazardous road conditions, and impacts to transportation systems. A positive outtake from these back to back storms has been the great collaboration efforts between Mashpee Wampanoag departments and Leadership (Tribal Administrator, Tribal PD, Tribal Security, Tribal DPW, Tribal NRD, Tribal Facilities, Tribal Communication’s, Tribal EMD, IHS) and outside partners which helped to ensure for the successful operation during these significant storms that have impacted our Tribal and surrounding communities and will be remembered for some time to come. 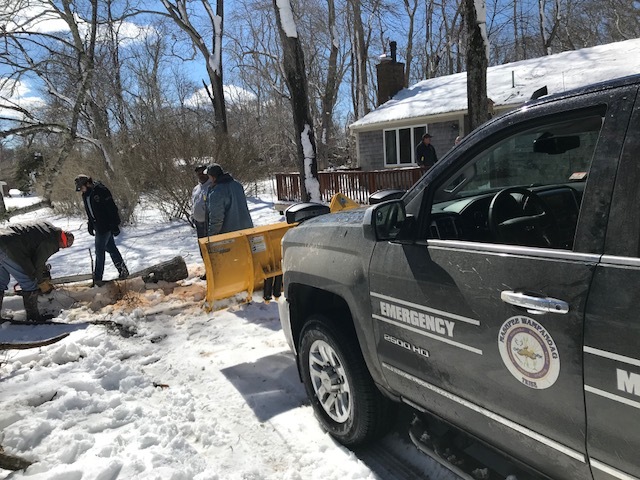 During this year’s first Nor’easter the Emergency Management Department that is made up of Emergency Management Director Nelson Andrews Jr. and Emergency Preparedness Specialist Allyssa Hathaway received numerous calls from the Tribal community with various requests. One of the first calls came from a Tribal elder in E. Falmouth with a report that a large portion of the roof to their residence had been blown off from the high wind gusts. Emergency Management Director Nelson Andrews Jr. reached out to Tribal Community Emergency Response Team (TCERT) and NRD staff member Clayton “CJ” Oakley Robbins to assist. CJ employed his father Michael Robbins who has a construction company to help and the two immediately responded and helped to “blue tarp” the roof of the tribal elders home. During these strong coastal storms the EM Department also enacted the Tribal Emergency Response Task Force (TERTF), which consists of key Tribal department heads who can collaborate share resources and support during incidents. The collaboration stemmed from various tribal departments who made themselves and staff available during the storm response and recovery efforts. As a result of the storms, there were many trees uprooted and knocked over some were blocking Tribal members homes and driveways. The public works Department, Natural Resource Department, along with the Emergency Management Department cut the blocked trees and removed debris. 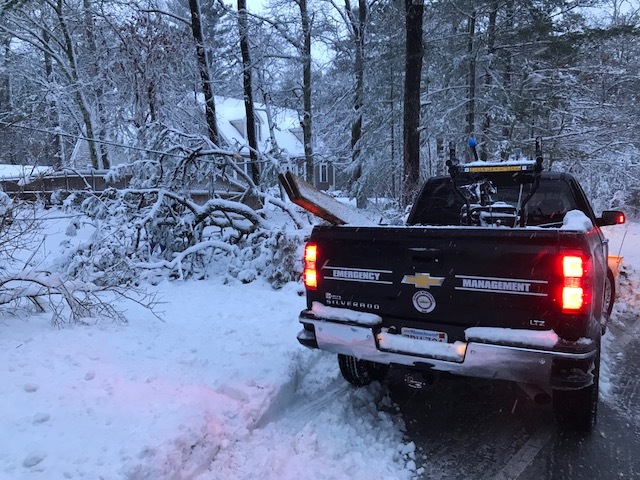 Widespread power outages were one of the primary concerns following the storms, during these outages the EM Department received a call from an elder in Mashpee who requested a transport for her herself and grandchildren to a warmer family members` house. The large majority of Tribal members were without power for several days and the Emergency Management Department was able to provide generators to vulnerable Tribal members with medical conditions. EM Director Andrews advises the community to always be ready and to have at least 3 days of emergency supplies, food and water at all times on hand to ensure constant preparedness in the event of a long term power outage situation.